Please excuse our bytes while we make the transition from Dividend Kid to A Bright Millennial! We are very excited to announce that after many many months of inactivity Dividend Kid will now become A Bright Millennial. Not to worry though, It still is old DK behind the umm keyboard. That said, the content of this site and it's associated social media accounts will shift quite drastically. Dividend Kid was a great start but through my writing Div Kid I found my true passion lay not with dividends, but in personal finance as a whole. Looking back some of my favorite posts alluded to this. Moving forward ABM will be about personal finance from the perspective of the millennial. Educating the masses in early life personal finance is extremely valuable and I have found a love for doing just that. Please stay tuned as ABM will soon become much more active than Div Kid ever was. Hold on to your butts... we are going places! October is over and a new month is upon us. Outside of investing many exciting things are going on in my life. Right now, I am writing this post from a hotel room in downtown Chicago! Mrs. Dividend Kid is interviewing at Loyola Medical school tomorrow and we decided to experience the city for the weekend. With that the number of jobs I have applied for in Chicago has increased dramatically. United Airlines, Northrup Grumman, Abbot Labs, and quite a few more are all in my sights. The opportunity to live in the same city as my significant other and work for a fortune 500 company checks nearly all the boxes for me! Chicago is a new, exciting, and expensive place, but we look forward to the possibility of experiencing life in this city. With October over and my October purchases post out it only makes sense to post my full portfolio update as well! Posting overviews of my monthly purchases and portfolio updates are very important to me. It keeps me on track and forces me to back up everything I say with everything I do. These days it is too easy to preach one thing and practice another, I refuse to do that. 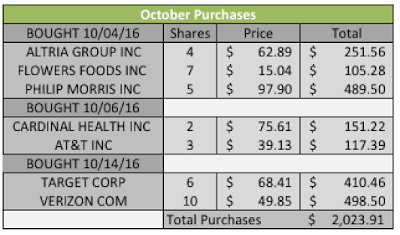 As of October I have officially hit $400.00 in total accumulated dividends! This was a great line to cross and I look forward to my next $400.00 and my first 1000.00 even more! In the month of October I received $24.00 in dividends which was a dramatic drop from Septembers all time high of $40.00. Octobers $24.00 does mark another interesting amount though. $24.00 is the largest non quarter end dividend payout I have ever received. As you can see by the sharp increase in the light grey area chart my dividend payouts should continue increasing as does the value of my portfolio! These charts are all updated and included in my portfolio page. If you liked this article make sure to let me know in the comments down below or give my blog page a follow! I love the dialogue I get with my readers and blog follows make sure you won't miss an update! As you may have noticed I decided to change up my theme a little bit in this update. I feel like it gives me a little more of an identity and I hope you do too! How much in dividends did you make last month? My last first semester of my undergraduate degree is coming to a close. With that, my schools career week has also come to pass. After the Supply Chain Management specific career fair I was invited to interview with a few fantastic companies including Dell and Exxon Mobile! I felt that those interviews went very well, though unfortunately I am no longer being recruited by Dell. Since then I have also been invited to interview at Lockheed Martin and General Dynamics! In other news, my lovely girl friend was recently extended two medical school interviews! It has been an extremely long and trying process for her and I can't wait to see where her path leads. The future is looking very bright in terms of my career and our future, for that I am truly excited. All of these thoughts of interviews, jobs and life after college really got me thinking. 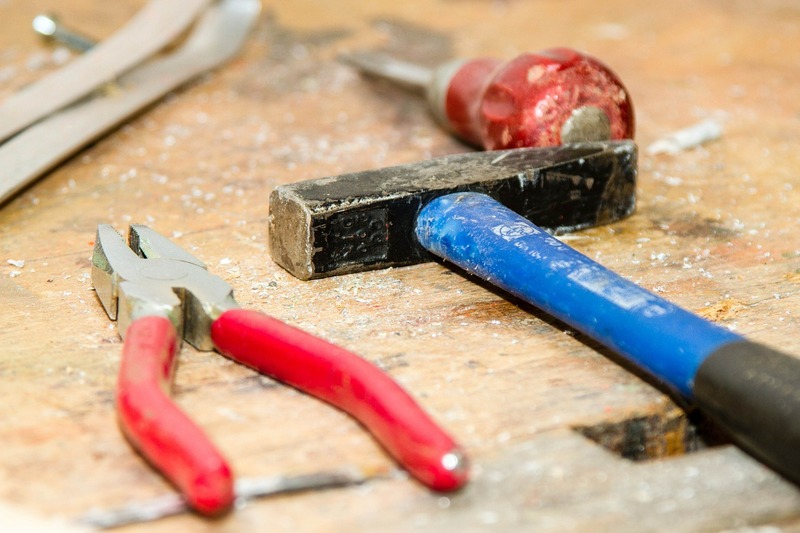 Of all the things you leave college with, a degree (hopefully), friends, and new experiences, the most important and vital to your success is a job. Getting a job is what college is all about. You can learn all you want but if you can't put your new found knowledge to work in some way Ill say it was all for not. If you are a business student like myself then you know how important leaving school WITH a job is. I would be willing to argue that the months immediately following your graduation is when you are the most valuable. Most graduates have never seen the amount of money they will be offered per year at their first job, and companies know this. As a college student it is very easy to get excited about $40,000, $50,000 or $60,000+ per year, especially when so many have student debt. These are income levels many older adults I know have, and because of this many students don't think to negotiate or think they shouldn't. But thats what the company wants you to think and thats exactly why you MUST negotiate. You just got out of class and you are headed back home to eat lunch (because you spend meaningful money and don't eat out that often). Your phone rings and it's the HR person you talked to from (company you have applied to). He or she will ask you how you have been and then talk about how impressed they were with your profile after the interview. They have decided to offer you the position! Your heart is racing and all you can think about is how nice it will be to have a real job! The HR rep will describe the offer going over most of the benefits and a few key points and at the end he or she will ask something along the lines of "What do you think?". THIS IS IT. This is where so many people get it wrong. If you hear the offer from the HR representative and you say "Sounds great, when do I start..." you have just lost all negotiation power as you have implicitly accepted the offer. If you hear the offer from the HR representative and you say "Sounds great, but I really think a salary of $65,000 instead of $60,000 would make it easier for me to accept the offer." you have also lost. Now the HR rep knows that all it will take to get you is an extra $5,000. Which for you might be all you want, buy you have just left thousands and thousands of dollars on the table. Maybe you think that salary is the only thing you should negotiate, or maybe you think salary is the most important thing you should negotiate. Well you would be wrong on both accounts. Aside from salary things you should and can negotiate are; a signing bonus, time off (sick days, Paid time off, and vacation time), relocation and moving expenses, flexible work hours/location, Health care, tuition reimbursement or professional development, stock options, Company phone, car, computer and more. Many of the things you can negotiate might not add a lot of money but many add a lot of value. Getting more vacation time won't get you paid, but it will allow you have a better work life balance. Consider the intangibles as they are often times just as valuable as the tangibles when starting your young career. The best part about all of this is you hold all the cards. The company has offered you, they want you and now it is your turn to see how much badly. You need to negotiate because they expected but also because you are worth it. 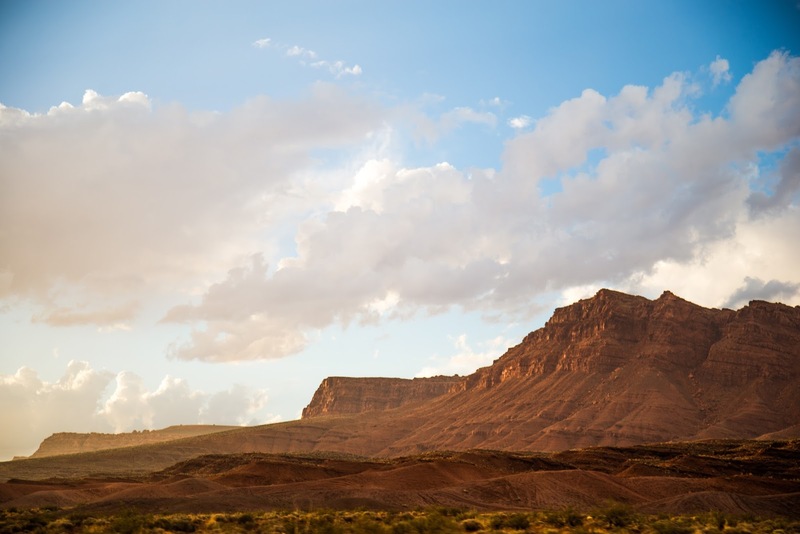 I know this article doesn't have much to do with dividend investing but it does have a lot to do with investing in yourself. Learning how to negotiate is an immeasurably valuable skill to have and will pay dividends in it's own right. This article was more personal finance based and I think it is valuable to discuss personal finance topics. Its never to early and never to late to learn more about personal finance and I think I will be adding a PF focused article in once or twice a month. As always if you have read this far please make sure to let me know what you think in the comment section. If you really enjoy my content make sure you stay up to date with me on twitter and Facebook! Whats you favorite factor to negotiate when considering job offers? I tend to stay up to date with multiple DGI blogs these days. While I don't typically comment as much as I can or should (I'm working on that) I love reading what the community and its members have to contribute each month. Some of my favorite posts each month are the recent purchases posts. Seeing what everyone has bought and their reasoning behind it is always so exciting. As a student pursing a Business Data Analytics certificate alongside my Supply Chain Management degree, seeing the technical analysis that goes into every purchase tells me that my certificate will not go unused. Furthermore, I have been able to utilize my skills with Microsoft Excel to create some very useful and pretty dang cool charts, graphs, and metrics analysis. I believe as a business student that being able to use Excel effectively is something that will be very beneficial for me moving forward. If you haven't already, I suggest looking into some free online Excel courses, even just to brush up. It seems everyday there is more data and more decisions to be made, all of which can be made easier with Excel. 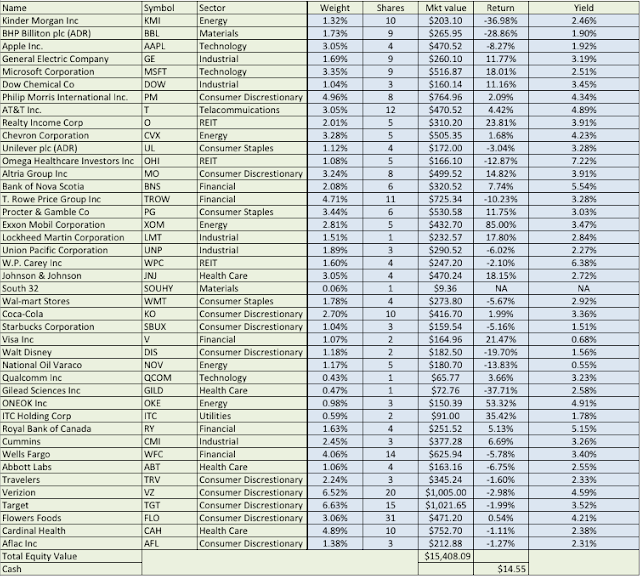 This month, I have decided to do my very first dividend analysis on the VF Corporation. Per their website, "Organized in 1899, VF Corporation is a global leader in branded lifestyle apparel, footwear and accessories, global iconic brands, 62,000 associates and $12.4 billion in revenue. VF’s businesses and brands are organized into four categories called coalitions, consisting of: Outdoor & Action Sports, Jeanswear, Imagewear and Sportswear. While VF is highly diversified across brands, products, distribution channels and geographies, our One VF culture and approach to doing business provide a unique and powerful competitive advantage." 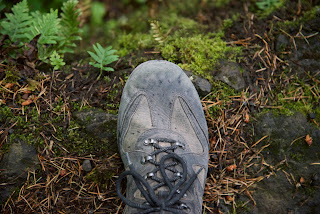 VFC has within its portfolio many brands I am sure are familiar to you: Jan Sport, Lee, Nautica, Reef, The North Face, Timberland, and last but maybe most notable, Van's. As someone who has only been around for 22 years, I can't say that I can grasp the idea of a company being around for more than 5x my lifespan. What I can grasp is the brands VFC holds. I've worn, or used more than a few of the brands listed above and it never occurred to me that they were all held by a single entity. Seeing the diversity of the brands gives VFC an early check mark from me as I typically like to see diverse, and established product lines in business in this sector. I'd like to provide some general information about VFC before moving forward. The information to follow is what I will have used in the dividend analysis to follow. All information gathered from www.gurufocus.com on 10/19/16. 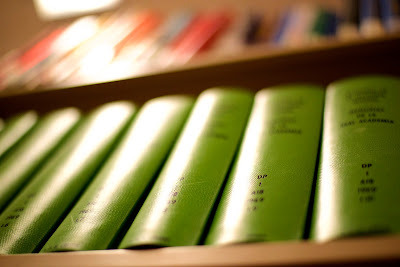 In my research I like to look at not only the company, but the market, the industry and several other factors as a whole to form an opinion. Utilizing a SWOT Analysis can help achieve a better overall picture of the forces in play here. Onto the part we've all been waiting for. I decided to focus on 14 key metrics that I deemed of the upmost importance when considering a potential purchase. Below you will find my overview chart listing these key metrics, my acceptance criteria. 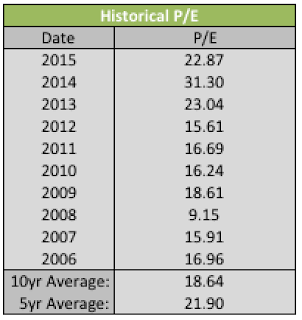 As you can see, according to the trailing twelve month P/E of 21.57 I am considering VFC over valued when compared against it's 10yr P/E average. In a similar manner, when comparing VFC's current P/E against it's 5yr P/E average I consider VFC Fairly Valued. Looking at the Forward P/E of VFC I believe better buying opportunities will present themselves. 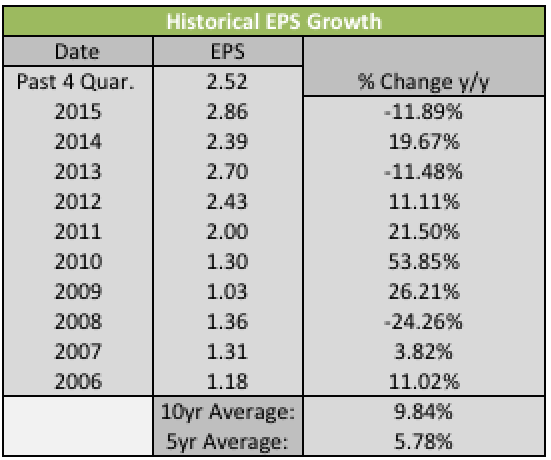 Continuing on to EPS growth over the last 10 years I feel that 9.84% is pretty respectable. This EPS growth has led to over double the EPS VFC had in 2006. 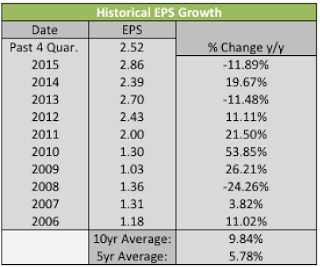 More recently EPS growth has slowed. This is not represented by the 5yr Earnings Growth Avg. as most of the recent downward movement has been within the last 3 years including the past 4 quarters. 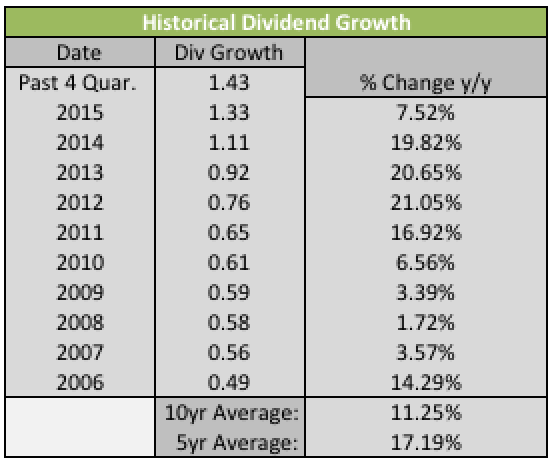 When deciding if a dividend is healthy and being increased in response to business growth my favorite metrics are: 10yr dividend growth, 5yr dividend growth, current yield, payout ratio, chowder, and years of continuous increases. In these aspects VFC is a winner, the 11.25% 10yr dividend growth average shows a continued commitment to returning larger amounts of cash to the shareholders and I like that. With a payout ratio below 65% and a current coverage ratio of 2.2 I think this dividend is more than sustainable. I like VFC and I think many of my fellow DGI bloggers do as well. The EPS has taken a small hit recently but this is providing us with the possible buying opportunity I am evaluating. With VFC's Dividend growth increasing, payout ratio under control, and P/E approaching fairly or under valued I am looking to start a position in VFC here pretty soon. A few percentage point drops in price and you will be seeing VFC in my recent purchases post. 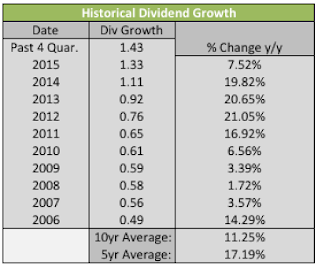 I hope you enjoyed my first real dividend analysis! Please, I repeat, please do not hesitate to tell me if you think I overlooked or miscalculated something. I put a lot of effort into the analysis and would love to hear some feedback both positive and constructive! Do you currently hold VFC? Are you looking to add VFC any time soon? Another month has passed us by and I have some exciting updates to share. My portfolio has increased by 105% year over year and 19% month over month. Looking back on my journey so far I feel I have made serious progress towards building a sound and diversified portfolio. In the last 20 months I have also accumulated $375 in dividend income. This is outstanding and now that the monthly income is starting to add up I can truly appreciate the power of dividends. As I once learned the power of compound interest the power of strong and stable dividends is just as powerful. 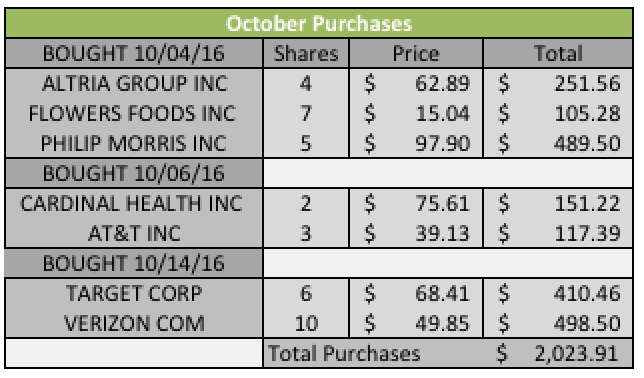 I look forward to what this month holds as I have already made the two largest single purchases of equity in my portfolio's history! 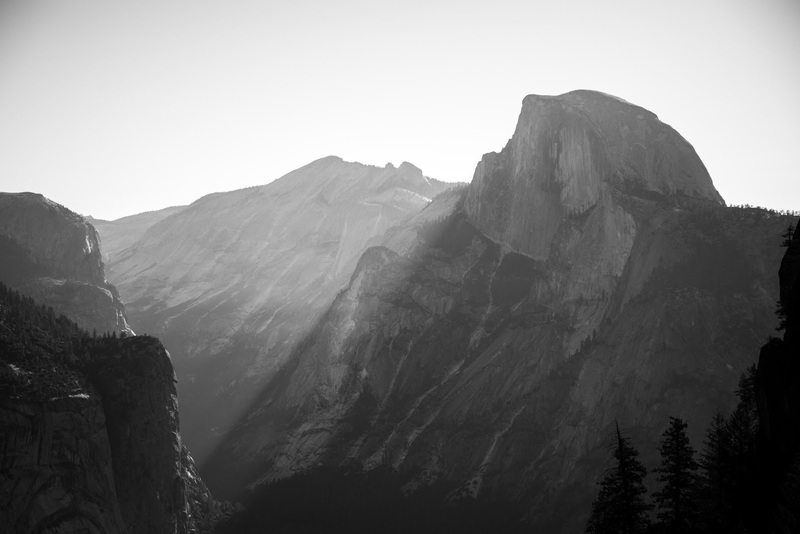 I would also like to mention that the thumbnail photo for this post is a photograph from yours truly. I have spoke in the past here, about spending meaningful money. As photography has always been a passion of mine I decided about a year ago to buy an extremely high quality, professional camera. This camera has not only led to me spending more quality time with friends and family outdoors, but will one day turn into a meaningful side hustle. Photography is a passion I can continue pursuing after I achieve financial independence for fun and income. Look for a post about side hustles and their value in the coming days! Here are my updated portfolio charts, metrics and a few other interesting measurable's for September of 2016. These charts and graphs are now reflected in the 'My Portfolio' page. Each month I make it a point to deploy new money into my investment accounts. 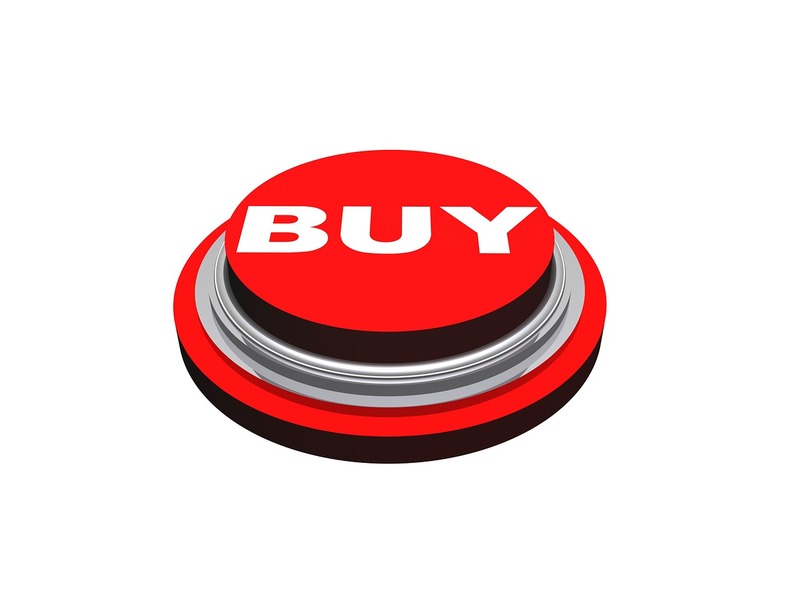 Updating my readers about purchases, considerations, and general activity is not only valuable content, but it keeps me accountable. As long as I can move up and to the right, I know I will achieve my goals. Buying stock in companies that pay sustainable and increasing dividends will one day cover my living expenses. This will make retiring at 30, 35, or 40 much easier to achieve. At the young age of 22 I feel like I am right where I want to be financially. I have no student loans thanks to my scholarships and the planning my parents. I have a ROTH IRA, Trad IRA, Personal investment account and the financial literacy of someone much older than myself. I am very fortunate to be where I am and am truly excited to see what the future holds. With out further delay, lets go over my acquisitions in the month of September. As I don't currently have a steady stream of income I have been adding to a few older positions and taking advantage undervalued companies as they come. These purchases represent a total increase in securities value of about $2171. Not only is this a significant amount of purchases, it is the largest month of acquisitions I have ever had. Multiplied across the number of shares these acquisitions have an average yield total of 3.75%. This is right where I want to be when purchasing high quality companies especially when the yield ranges from 2.31% - 4.91%. A yield range such as that shows that not only am I buying companies that are providing current income, but companies with the ability to continually increase distributions as well. This is very important for someone starting out on their journey. Often times beginners can be reeled in by high single digit or even double digit yields while they represent significant risk. Finally, these purchases equate to an increase of $17.60 in quarterly dividend income. This is what I am most excited about. Continuing to increase my quarterly dividend income is what this is all about. I look forward to the opportunity to deploy more capital in the month of October and hope you do too! Have you added any similar positions to your own portfolio recently? Like I mentioned in my previous post I spent this summer in Omaha Nebraska working for Union Pacific Rail Road. Not only was this a great time for me to learn more about my career field but I also learned many things relevant to investing. Union Pacific liked to talk about moving up and to the right. They used this to talk about charts comparing cost avoidance and customer satisfaction. The goal of this chart was to show an increase in cost avoidance over the year, while increasing the supplier customer satisfaction. Up and to the right can be used in many areas and after looking at my portfolio I decided to create my own up and to the right graph. My graph compares total portfolio value and dividends received. I think for someone starting their journey like me seeing these two lines on the same graph is very important. Without further delay here is my up and to the right graph. As you can see this shows my portfolio value and dividends received moving up and to the right. Not only are my portfolio value and dividends received increasing, but they are still increasing and should always increase. This graph is something I want to continue utilizing so I have added it to My Portfolio page as well. I look forward to exiting college with no student debt and continuing on this journey towards financial freedom. Do you have any goals you can measure looking up and to the right? If you graphed these values would your graph look like mine? Have you learned anything from your career you can apply to investing? I am a 21 year old kid who seeks to create a life of financial independence via passive income. The accumulation and growth of quality dividend yielding stocks will be the main source of income and this is my journey. As Promised I will be slowly but surely making my return to blogging about my DGI journey! Things have been more than exciting for me as of late. This summer I completed my internship at Union Pacific Railroad. It was an absolute blast to have the opportunity to work at such a great company. It was very interesting being a shareholder for nearly 1 year before working at UP. Being a share hold was actually something I brought up in my interview! More recently, I started the fall semester of my senior year at Arizona State University! I look forward to graduating with my degree in Supply Chain Management and going to work for a great company very soon. So far I have applied at Honeywell, Lockheed Martin, 3M, General Dynamics, Exxon, Dell, Rolls Royce, Intel, Raytheon and a few others. I am blessed to have the opportunity to work at these companies and come out of school with a degree in a top ranked program. As far as investing goes, things have never been better. my portfolio has increased significantly since the last time I wrote here. I don't necessarily have a steady stream of income as a student. Saving money from my internship and consistently moving money from my savings (not my emergency fund) has allowed me to deploy capital in meaningful ways. 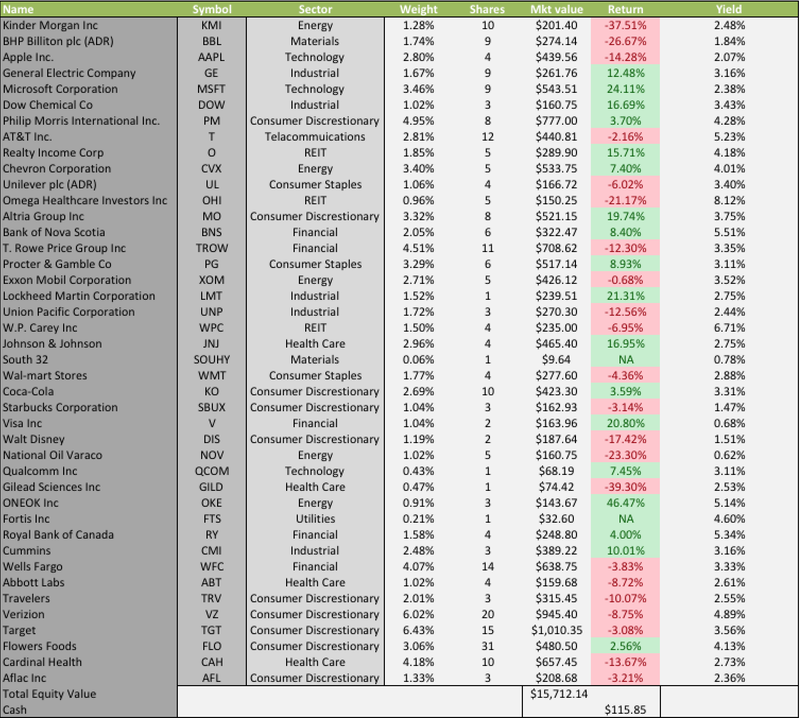 Ive begun to go through and update my excel sheets and other tools I used to track my portfolio and am excited to show you those in the coming days! As for now I hope you are sticking with your journey and achieving your goals! What do you do when you find it hard to keep writing? Do you have a plan for a sudden reduction in income? Where are you at with your current goals? I used to write this blog near weekly and it saddens me that this is the firs post I will have published in about a year. I look forward of getting back in the swing of things and writing post for anyone interested in reading them.